There may be no such thing as a free lunch — but if you’re eyeing a free donut today, you’re in luck. In honor of National Donut Day, Dunkin’ Donuts and Krispy Kreme Doughnuts are running in-store promotions on Friday and taking part in the opening and closing ceremonies at their respective stock exchanges, the NASDAQ and the New York Stock Exchange. At participating Dunkin’ Donuts locations, customers can score a free donut of their choice with the purchase of any beverage. On Twitter, the company will also post donut trivia questions, and users who answer correctly will be entered for a chance to win one of six $50 gift cards. Meanwhile, Krispy Kremes in the U.S. and Canada will give away a free donut of any variety with no purchase necessary. 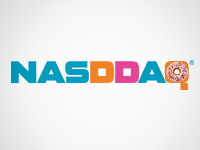 The Nasdaq, whose opening bell Dunkin’ rang this morning, has unofficially changed its name to “NASDDAQ” and incorporated the company’s pink and orange ‘D’ letters along with a sprinkled donut into its logo. Krispy Kreme will stop by the NYSE to ring the closing bell. In New York City, Entenmann’s Bakery will hand out free donuts at Madison Square Park and present a $25,000 check to The Salvation Army, which will be providing free coffee to celebrants. National Donut Day was first established by the charity in 1938 in Chicago as a way of honoring the “Donut Lassies” who served soldiers the treats during World War I and helped raise money during the Great Depression. The events’ organizers will also share a proclamation letter from Mayor Bloomberg in honor of the holiday. The event comes just one day after Bloomberg announced a proposed ban of the sale of sweetened drinks larger than 16 fluid ounces at restaurants, movie theaters and delis. If approved, the controversial plan could be implemented as soon as next March. Despite their confectionery names, these companies rely on more than merely donuts to fuel their businesses. “I think what we have seen is chains like Krispy Kreme, Tim Hortons and Dunkin’ Donuts that have shifted from being traditional donut chains to serve broader occasions and day parts,” said Darren Tristano, executive vice president at Technomic. Despite the strength of the cupcake trend, Tristano said that sales in the donut industry have been relatively stable. He added that this continued donut popularity speaks to the rise of snacking and eating during off-peak occasions. Dunkin’ has responded to this demand by expanding its line of bakery sandwiches. Michelle King, Dunkin’ Brands’ director of global public relations, said breakfast sandwiches are already popular with customers, who have been purchasing them throughout the day. “All are familiar with a twist and cater to our busy guests who are snacking more frequently throughout a ‘clockless day,’ ” she said about the new sandwiches. Although Dunkin and Krispy Kreme carry many similar products, Dunkin has enjoyed stronger sales and location growth compared to Krispy Kreme, according to Technomic estimates. At Dunkin’, U.S. sales grew 23 percent from 2007 to last year while Krispy Kreme sales fell 13 percent during the same period. Part of Dunkin’s success is due to the popularity of its coffee product. Companies place added emphasis on coffee since it typically carries a higher margin than items, such as donuts. Customers who incorporate a restaurant serving coffee into their daily routine often go to that chosen store every day and may purchase additional items while there. “By providing coffee and other products in addition to donuts, industry operators hope to attract consumers to their stores more frequently,” said Agata Kaczanowska, lead industry analyst at the research firm IBISWorld. In September, Krispy Kreme announced the launch of three signature coffee blends. The company has also stepped up its expansion efforts internationally; it recently announced new development agreements in India and Russia. This international push follows declines in U.S. store locations in both 2008 and 2009, according to Technomic data. The company added one net domestic location last year. “The issue with Krispy Kreme was that they broadened so much, you could get them at the grocery stores, the convenience store, so why would you get them at the restaurant?” Tristano said. In addition to promoting coffee to drive sales, donut shops are reacting to another trend to boost revenue, Kaczanowska said. This entry was posted on Friday, July 13th, 2012 at 9:00 am and is filed under Advertising, Contests, Donut, Gift Cards, Snacking, Social Media. You can follow any responses to this entry through the RSS 2.0 feed. You can leave a response, or trackback from your own site.